Feeling squeamish about buying U.S. stocks at these levels? Perfectly understandable. But remember the first law of stock market physics: What goes up tends to keep going up. Think banks — but not just the U.S. variety. Why not spread out your bets? Sure, American banks are unloved and a good value. But international banks — trading at near-historic lows — are an even better buy. As I noted in recent weeks, emerging markets are a bargain. Why not plug your money into an asset like global banking? Why not get the best of both worlds, economic growth and rising interest rates, at a reasonable price? That’s why the iShares Global Financials ETF (NYSE: IXG) is an exchange-traded fund (ETF) to keep your eye on. Half the ETF’s portfolio contains U.S. banking securities — JPMorgan Chase, Bank of America, Berkshire Hathaway, Citigroup and Wells Fargo. Fair enough. The rest are in commodity-heavy markets like Canada and Australia, and emerging economies like China and Brazil — all of which are trading at discounted values not seen in years. Just how cheap are they? The ETF is trading at a book value of 0.95. Translation? Investors are pricing the stock at less than the value of the banks’ loans and cash all put together. 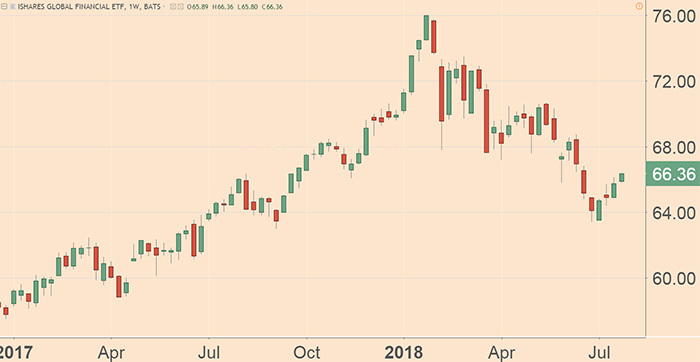 The last time the ETF traded this cheaply on an annual basis? The depths of the financial crisis, back during the bad old days of 2008-2009. The thing is, we’re not in a financial crisis. According to the International Monetary Fund, the global economy is advancing at a 3.9% annual rate. With an ongoing expansion, interest rates are on the rise not just in the U.S. but — for the first time since the financial crisis — a wide array of international markets. Canada’s central bank raised rates earlier this month — the latest of four hikes in the past year. Turkey has raised rates three times since April. The Bank of England is expected to raise rates in coming days for the first time since 2009. Yes, there are risks. The Federal Reserve could overdo its ongoing rate hikes. The Trump administration could overplay its hand on trade. But as I see it, the risk lies more with dollar assets losing value. What happens when the dollar declines in value? Those assets are redeployed elsewhere in the global economy. International markets (and their banks) reap the benefits. « Previous Can China Afford To Have A Trade War?